Summer is just right around the corner and swim season is fast approaching. For some kids this will be their main sport, for others this will be just one of many. Swimming is one of the safest sports to participate in, however too much of a good thing can be a bad thing. Water sports are great because it allows one to exercise at a high intensity, there is not that much stress on the back and legs. It is great for a whole body work out and allows someone, in one hour, to be able to burn as many calories as in a one-hour run. Typically, one doesn’t think of swimming as a sport that leads to many injuries. Swimming is an overhead sport and the human body is not made to handle a lot of overhead activities. Swimming too much can lead to overuse injuries. The main ones are shoulders pain and occasionally knee pain. The training for competitive swimmers has changed in recent years. Training now requires swimming a lot of laps. All this swimming leads to more overuse injuries, like the ones we see in baseball pitchers and runners. Shoulder pain is the major problem swimmers will “swim” into because using the same muscles over and over can lead to the muscles in the chest and back being unequally strong. These muscles not being equal can lead to bad swimming form which will then lead to shoulder pain. 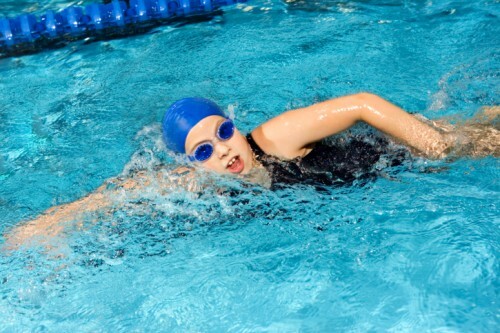 Swimming strokes that can lead to shoulder pain are freestyle, back stroke and butterfly. Swimmers that participate in breast stroke are as at risk as other strokes for shoulder pain, but can also develop knee pain. This comes from the knee cap shifting and rubbing on other parts of the knee joint leading to knee pain. It is important for coaches and parents to know how to keep their young swimmers safe, what to look for, and what questions to ask their kids to ensure that they are staying safe and not injuring themselves. Parents and coaches can help their swimmers by being an extra pairs of eyes, because the young athletes don’t know any better. Rest: Athletes participating in overhead activities should not participate in these activities for at least three months out of the year. This means that it is good for parents to encourage their child to try different sports, specifically ones that don’t involve overhead activities. Warmup: Ensure that your swimmer is warmed up properly. It is never good to get into a pool cold. The type of warm up is important too. Make sure that the warm ups are active and not passive stretches. There are a lot of traditional stretches that swimmers do to warm up their arms. These warm ups target parts of the shoulders that keep the joint stable. It is important to warm up and actively stretch the muscles themselves and not the shoulder joint. Hydration: Lastly, make sure to drink a lot of water. Being in a pool dehydrates the body on top of the sweating that occurs while working out. Training should not exceed 60 minutes and no more than three times a week. Learn how to properly perform the basics of the strokes. Training should not exceed 120 minutes and no more than 6 times a week. Learning how to decrease wasted energy with strokes. At Cook Children’s, our SPORTS physical therapists are trained in proper rehabilitation of overuse injuries and work to restore full function and safely guide return to athletic activities. If your child has a history of injuries from swimming or you are concerned about risk of future injury, talk to your pediatrician about a referral to physical therapy. Alan Littenberg, PT, DPT, is a SPORTS physical therapist at Cook Children's. Cook Children’s SPORTS Rehab is a leader in the community in sports injury. Additional information and helpful tips can be found on the Cook Children’s SPORTS Rehab website. Cook Children’s SPORTS Rehab is a leader in the community in sports injury prevention.